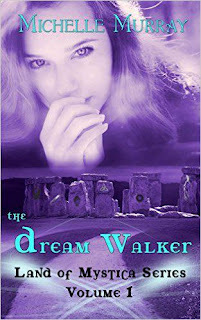 Official Genre: middle grade fantasy (ages 8-12) but loved by all ages. Miranda is having vivid dreams of a world she's never been to. A world full of castles, Forests, Ice Caves, and Dragons. 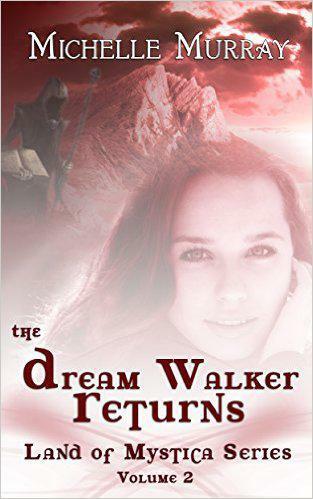 She goes to a bookstore to see about these dreams, and discovers she is a Dream Walker. She has been called to save this mystical, magical world. On Mystica, the evil wizard Midnight has been released. Midnight is gathering an army, and preparing for war. Miranda needs to find and release the white wizard Lightning from his stone prison to save Mystica. 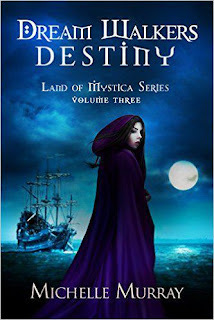 Follow Miranda as she travels through Mystica. Can she find and release Lightning and save Mystica? Once there were six wizards who lived upon Mystica. Three of these wizards wore white robes and worshipped the Goddess of the Sun. Lightning was the oldest and strongest white wizard. Wrinkles lined his face. His bones showed through his skin, making him look frail. Silver lightning streaks decorated his robe. White hair laid atop of his head. Blue eyes peered through his wrinkled face. He often carried lightning streaks in his hands, ready to strike at any minute. He traveled through Mystica in cloud or smoke form, keeping the dark wizards in check and the magic of Mystica in balance. When he wasn’t wondering the land, he slept in the clouds. If there were no clouds, he made them with his magic. Lightning was followed by Silver. Silver was the middle white wizard. His skin sparkled like his namesake. Silver trim highlighted the hem and cuffs of his robe. Silver streaks ran through his white hair. He made his home in the dwarf mines when not battling the dark wizards. If the dwarf mines were not available, he would find a location that had minerals or stones embedded in the rocks. The youngest of the white wizards was Polaris. His skin was etched with the stars on it, almost like tattoos. The shape of the bear constellation with his namesake in it was stitched in gold and silver on his robe. It shone at night, twinkling in and out just like the stars. He slept in the open, preferring to see the star he was named after and daydream. Building things out of the land occupied his time when he wasn’t battling the dark wizards. Though, the dark wizards often destroyed his creations for fun. The dark wizards wore black robes and worshipped the God of the Night. They liked to cause trouble and havoc, which the white wizards often had to fix. They would cause fights among the people of Mystica by playing tricks on them. Farm crops would be stolen. Horses and cows would be released from their pens. Fires would be started in villages and towns. They would do this tricks in the dark of night, and the people would blame each other. If the white wizards caught them, they would fix the tricks before anyone woke up and no one was the wiser. Fires were put out. Horses and cattle were returned. Farm crops would be replaced. It was often a game of cat and mouse. The wizards chasing each other across Mystica. The oldest and strongest of the dark wizards was Midnight. He often caused the most trouble. He especially liked seeing and hearing the screams and terrors of the villagers. Midnight’s skin was dark like his name and sky at midnight. His eyes were an icy grey. Pictures of galaxies and clouds embellish his black robe, like you were looking at the night sky. Lightning and Midnight often had grand duels of magic being the two strongest wizards which often ended in a duel. After Lightning and Midnight, Shadow, the middle dark wizard, had a special unique magic. Shadow could create and control shadows. He had a special robe that was embodied with grey shadows that danced around it, and moved with it. Tufts of shadow were entwined in his black hair. He used this magic to frighten people and animals. It took all light and hope away, and replaced it with fear, hate, and anger. It made for fun games to play on the people of Mytica. When not playing games with his shadows, Shadow had an inquisitive nature and liked to find out the “why” of things. The other wizards made fun of him for this, so he often hid his quests of finding out answers from them. The last of the dark wizards was Spyder. Spyder was the youngest dark wizard. He was tall and skinny with long arms and legs, like a spider. His hair looked more like a spider web than hair. His skin resembled the coloring of a black widow, black with red streaks. Spiders crawled all over his robe, and in his hair and beard. They were his constant companions. His eyes were white with spiders on the irises. As the youngest, he was often ignored. This made him yearn for attention, and he would do anything to get it. One of the wizards of the black robes grew weary of the constant battles with the white wizards. Midnight wanted more power. He wanted to defeat the wizards of the white robes once and for all, and claim Mystica for himself. He grew especially weary of his magic battles with Lightning, the only white wizard that could defeat him in a wizard duel. He was deterred from outright killing the other wizards for, if the wizards died, so did the land of Mystica. Mystic and the magic of the wizards were connected in an odd way Midnight could not figure out. It was no use ruling a dying land. He had to find another way to defeat the other meddling wizards. The Darkness has waited a long time to return to Mystica. Now, with the help of the wizard Shadow it has found a way back into the land. It will stop at nothing and no one to darken all of Mystica. Miranda is called to Mystica to help fight the Darkness. Her friend Brian follows. Does he mean to help or hinder her? 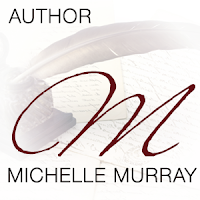 Can Miranda stop the Darkness and save Mystica, and if so at what cost? 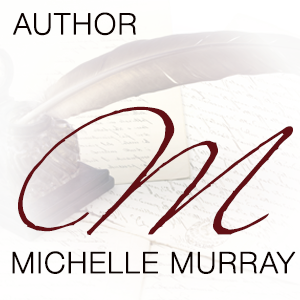 Kate had watched Miranda on her first journey to Mystica, and knew just how powerful she was. Yet, Miranda did not know or seem to understand the power she held. Kate had been a watcher her whole life, watching for people with magic powers. Watching them change, and shape the world. She was tired of watching, she wanted to be doing. Yet, she had no magical powers of her own, so she had to find people to do her bidding. Finding someone to trust her, and say a spell for her was the tricky part. Then, she remembered a boy she met last summer named Brian. He had magic powers he didn’t even know he had, and a streak for the dark side. She started supplying him with candles, potions, and spells. He tried each and every one, and reported back to her on his success or failure. 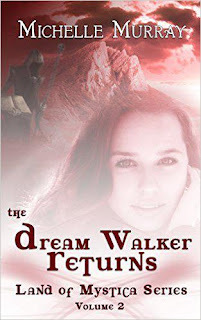 Now, with a Dream Walker in her midst, it was time to work with him even more closely. Together, they would bring her over to the Dark One. Kate had a spell as backup in case Brian could not seduce her. She had no doubt with his good looks and charm, he would succeed, but it never hurt to have a backup plan. Brian though it was just another practice spell. He didn’t realize he had released the Darkness upon Mystica, and he probably wouldn’t have cared if he did. He wanted to use his powers. He wanted to do big things. He wanted to leave a difference, good or bad in the world. Now, he would have his chance. The last dark wizard Spyder has been freed from his stone prison. His one quest is to find the last white wizard's stone. Spyder recruits the pirates from Dead Man's Island to help him. With the magic out of balance of Mystica, the land starts to rumble and shake. Tremors are felt throughout the land. Miranda is called back to set things right. Miranda and her companions travel to the Lost Islands to find the same stone. The Pirates are not far behind. It is a race to see who will find Polaris first. Miranda needs to bring both wizards safely back to Mystica before the Red Mountain spews its lava. Danger awaits her at every turn. The fate of Mystica rests in Miranda and her dreams. Spyder’s stone traveled a long way from Mystica. A single dark black stone crashed, tumbling over the waves of the Ocean of Mystica. It went with the crests of water following the currents of the ocean. It bobbed along the white foam, carried further and further away. The tides took it with them to the Ice Island, named because it was all ice and snow. The moment the waves hit the shores of Ice Island, they turned to solid ice. Fissures opened where the warm waves of the ocean hit the cold shores of Ice Island. The stone rolled onto these fissures. It was like a marble in a wooden maze, rolling along where the cracks created a patch in the ice. The stone landed in a ceremonial circle of the Valerie. The Valerie were inhabitants of the land. The Valerie had blue skin and white eyes. White furred robes adorned their bodies. Icicles formed their hair; even their eyebrows were a frozen ice of white. The Valerie did not notice the black stone as they were in the middle of chanting and praying to the Ice Volcano, which they worshipped. Around and around the ceremonial circle they went, dancing, chanting, and beating the ice drums. To them, it was a sacred ceremony to keep the Ice Volcano from spewing its frozen ice all over their village and prey. They took it very seriously and let nothing, no animals, lightning, or a strange stone disturb the ceremony and make the Ice Volcano angry. The Valerie lived a simple life, hunting and gathering. They learned to make many things out of their ice surroundings, including homes, drums, arrows, spears, and even bowls. The chosen Valerie who had demonstrated strength and wisdom by killing prey and protecting the women and children participated in this ceremony. The chanting of the Valerie grew more intense, and the drums beat louder and faster. It reached a crescendo of music and energy. The energy reached the black stone, and it cracked open in a puff of black smoke. When the smoke dissipated, the wizard Spyder was in the midst of the Valerie ceremony! Spyder was the last dark wizard of Mystica. He had long skinny arms and legs, like a spider. He was tall and skinny with spiders in his hair and beard. He wore a black robe with spider webs and spiders crawling all over it. He had white eyes with pictures of spiders on the inside of the irises. His skin was black like a black widow, and his hair was white where the spiders were not nesting. It looked like a spider web instead of hair upon his head. Both the Valerie and Spyder were in shock at this turn of events. Spyder had no idea where he was, or how he had gotten so far away from his homeland of Mystica. The Valerie thought he was a god come to save them. The drums and chanting ended as all of the Valerie kneeled down to Spyder. Trying to get his bearings, Spyder saw in the distance the Ice Volcano. Spyder wanted to find out where he was, and how to get back to Mystica. Seeing the volcano gave him an idea. Perhaps he could mind speak to his brothers or his father through the volcano. Spyder’s father was the God of Night, and he lived under the Red Mountain, which held a dormant volcano in Mystica. The God of Night was a tricky one, who thrived on deceits, lies, and trickery. The God of Night wanted to find his last son. As out of his two sons, one was dead, and one was now human. His hopes lay with Spyder, the last dark wizard. Yet, the God of Night’s magic was limited outside of Mystica. Without the magic of the wizards, it was growing scarce on Mystica. If it had not been for Shadow and Silver giving up theirs, Mystica would have no magic at all.